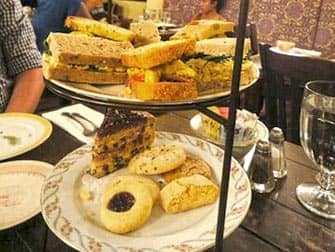 High Tea at Alice’s Tea Cup is perfect when you want to exchange the hustle and bustle of New York for a moment from a fairy-tale. 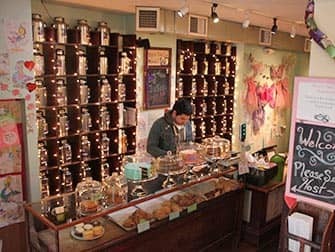 This wonderland full of freshly baked cookies, cake, scones and dozens of different flavoured teas has three different locations in the Upper East and Upper West Side of New York. This is the place to have a delicious high tea. 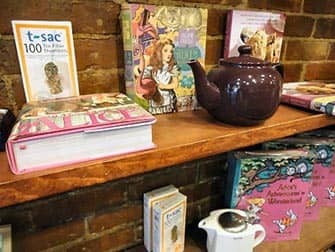 The different locations of Alice’s Tea Cup are inspired by Alice in Wonderland and because of this, they are also called Chapter I, Chapter II and Chapter III respectively. The interior decoration is different at each place but each references either scenes from the book or the film. The menus are pretty much the same and include next to the sweet snacks, also sandwiches, soups, salads and main meals. There is a huge assortment of different teas from all around the world that are served in cute pots. Even though you can also have lunch at Alice’s Tea Cup, the high teas are more popular. You can pick one of three different variations of the Alice’s Afternoon Tea, depending on the amount of people joining you. “The Nibble” is for one person, “The Mad-hatter” for two to four people and “The Jabberwocky” fills the stomachs of a large hungry group. 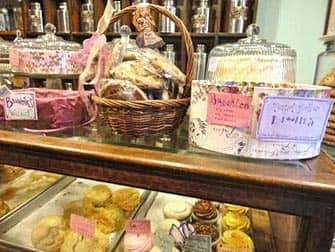 All variations are complemented with a pot of tea per person (you can of course pick the flavour), sandwiches of your choice, freshly baked scones and a selection of cake and cookies. All of this is presented on wonderful platters. The sandwiches are impossibly fresh and the scones are still warm when served. 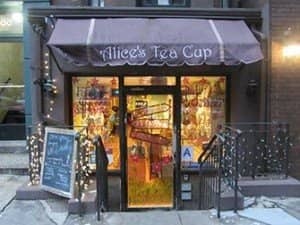 Alice’s Tea Cup is a favourite with the mothers and nannies of the Upper East and Upper West Side. It is indeed a great place to bring the kids. Especially because the finger food – in particular the cakes and cookies – are loved by all the kids. This doesn’t mean that Alice’s Tea Cup is only suitable for children. 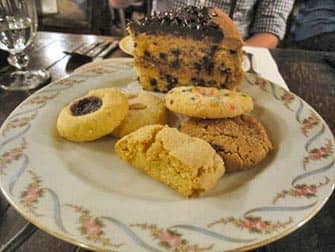 The locations have been decorated such that there is a tearoom for parents with children and another tearoom for adults, where they can sit in peace and enjoy their high tea. So it’s perfect to enjoy a high tea with girlfriends, sisters, mothers and even lovers. Enjoying a high tea at Alice’s Tea Cup isn’t cheap but a fun experience nevertheless. You can also have breakfast, brunch of lunch there. If you want to reserve for a high tea, then do so at least a couple of days beforehand. The places are very popular which means that you probably can’t just drop by on any given day. 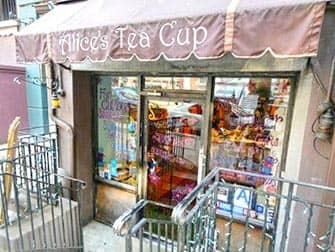 You’ll find Alice’s Tea Cup on 102 West 73rd Street (Chapter 1, Upper West Side), on 156 East 64th Street (Chapter 2, Upper East Side) and on 220 East 81st Street (Chapter 3, Upper East Side).